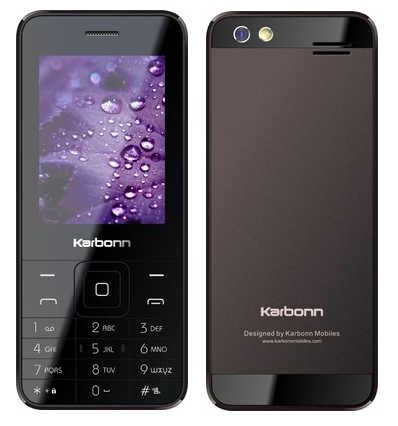 Karbonn has revealed a new device named as Karbonn K Phone 1 which has its (Unique Selling Proposition) as the looks of iPhone 5S. The device is nowhere related to the Android OS rather it is powered by a Java based OS. The price of this device is only 1699 INR but it gives you the visually same back panel of iPhone 5S. The image posted below makes it clear. As you can see that the price of the device is really low and so obviously this doesn’t come with the touch-screen rather you will have an alphanumeric keypad with 2.4 Inches LCD display. The primary camera used on this device is of 1.3 MP accompanied by an LED Flash light and there is no front camera on the phone. The device has 2 SIM slots and supports the external memory card up to 8 GB. Users may buy this device because of its low price and the looks of the back panel which looks pretty much similar to that of iPhone 5S. You can buy this device from Flipkart with 1 year warranty for the device and 6 months for the other accessories.